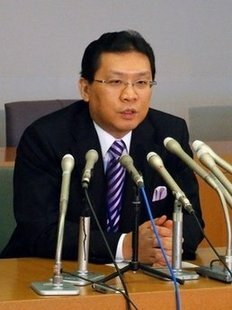 Hironobu Narisawa, the 44-year-old mayor of Tokyo& #39;s Bunkyo ward, announces that he will take two-week& #39;s paternity leave to look after his first-born child, a first for a Japanese local government chief, at a press conference at the ward office in Tokyo on March 11. Two weeks& #39; paternity leave may not seem like much, but for Hironobu Narisawa, the 44-year-old mayor of a Tokyo district, it is a leap into the future for Japanese society. Next month he will become Japan& #39;s first local government chief to take time off work to look after a child, a move he hopes will encourage other men to do the same in a nation struggling with a low birthrate. Narisawa, the mayor of Tokyo& #39;s Bunkyo Ward, will swap his desk and PC for the world of sterilized bottles, baby formula and nappy changes for his first child, who was born on February 5. "I want to take time to raise my son and give him a lot of love," he told a nationally-televised news conference. "I wanted to experience both the importance and the difficulties of child raising. I want to set an example that other men will follow." Japanese law allows either parent to take leave of up to one year after childbirth, but almost all of those who do so are women, a reflection of traditional gender roles that remain entrenched. No male employees of Bunkyo ward are currently on paternity leave, the news conference was told. Nationwide, only 1.2 percent of fathers take advantage of paternity leave. Proud dad Narisawa is on a mission to change that and follow in the footsteps of male politicians elsewhere who have taken out time for their tots, among them former British premier Tony Blair. "In some European countries such as France, it is not unusual for fathers to take three to five weeks off for child-rearing," Narisawa said. "It is a matter of political systems and this should be seriously discussed in Japan." National government officials praised mayor Narisawa for taking the lead on a more balanced approach to work and parenting. "Surveys show the main reason so few men take paternity leave is the lack of understanding from superiors and colleagues," said Yumiko Jozuka, who heads the national government& #39;s welfare ministry. "It& #39;s wonderful that someone with social influence, such as the head of a local government, is taking some leave because it helps promote social awareness," she said. But even with high-profile advocates like Narisawa, a sudden baby boom seems unlikely in Japan any time soon. A survey last year found that more than 40 percent of Japanese people do not feel the need to have children after marriage.